It’s official. As of last night, I am a beekeeper. Me and my 8,000 new backyard buddies. It feels very strange to write those words. My mental image of a beekeeper used to be some sort of slightly feral sage, an interesting sort of semi-holy person standing quietly in the midst of a raging storm of flying, buzzing, stinging creatures. In other words, someone who is not me. Feral is a good description of me as a housekeeper, or a writer. But the closest I get to sage is Thanksgiving dinner, when I’m making the stuffing. When I got home from work yesterday, Sweetheart had the bike out and ready. I was just walking toward him when Tammy, Dan and her son Larry showed up. I met Tammy at Large Midwestern Technical College not long ago, and we quickly discovered that Larry goes to the school down the block from me and one of his teachers is a friend. So, we invited them to hang out with us for a bit while I carried the newly-painted hive box, bottom board and top out to the back yard and placed them on the stand. I replaced two of the wax-only frames with honey frames, so my bees would have something to eat until there is enough flowering plant life to sustain them. Kind of like a bee SNAP program (that would be food assistance, for all you non-US readers) that works the way it’s intended to work – a handup, not a handout. If all goes well, they’ll be making their food soon enough. Tammy told me a beekeeper is coming to one of her classes to present soon, and I kind of want to hear that presentation. (Note to self: Find out when.) I also showed her some pictures from a terrific book I’m reading. It’s called “Plan Bee: Everything you ever wanted to know about the hardest-working creatures on the planet” by Susan Brackney. I love this woman’s outlook on bees and beekeeping. Also her nose for research and her companionable writing style. Brackney goes on to describe the hazards of introducing a new queen into an existing hive, and does what Sweetheart and I did last night with our queen (who I have named Latifah, in case you were wondering). The queen cage is a small wood block, about 1.5 inches long and hollowed out in the middle. There’s a layer of mesh stapled around the hollowed out side with a hole on one end. The hole is plugged up with a small bit of cork. After making sure you’ve got your finger close to the cork, you pry it off with a small knife and plug the hole with your hand so she doesn’t fly away. Then, you jam a miniature marshmallow into the hole. Take your marshmallow-cage queen, and turn the block so the mesh side is facing down into the hive. Place the block between two honey frames. The time it takes for the queen to eat through the marshmallow on one side, with bees on the other side helping her, gives everyone a chance to get used to each other. The queen drops down into the hive, starts laying eggs, and everyone lives happily ever after. Anyway, Brackney decided to throw caution to the winds and skip the slow introduction process. Any writer who can come up with a phrase like “a kazoo being played like a teakettle” is my kind of writer. She’s actually anyone’s kind of writer if you’re interested in bees and like your facts wrapped up in engaging prose. 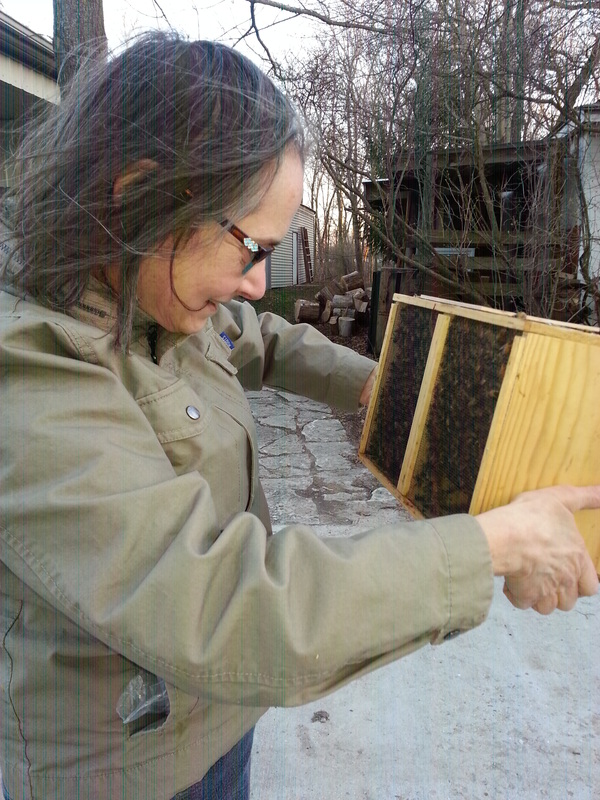 Enlisting Susan Brackney as a beekeeping resource was as easy as plucking her book off a sale rack. But my real beekeeping knight in shining armor (okay, so his shining armor is a flannel shirt, but who’s counting?) is Andy Hemken. Andy taught the Beginning Beekeeping workshop I took on Valentine’s Day. When I saw him at the beekeeping meeting, he looked over the Mann Lake order my friend Jeff helped me put together. There were a couple of things he said not to bother with because he had them and I could come out and pick them up. Then, when the Mann Lake order wasn’t here but the bees were going to be, Andy told me not to worry. We drove out to his place over the weekend with every bee thing we had, and he looked it all over. He suggested we paint the box, and gave me a new bottom board and a top (Jeff was using a slab of something that wasn’t a beehive top). When we asked how much we owed him, he said $10. It seemed like way too little, especially given how reassuring it was to have someone treat as pretty much routine that we’d be fine making a go at this beekeeping thing. 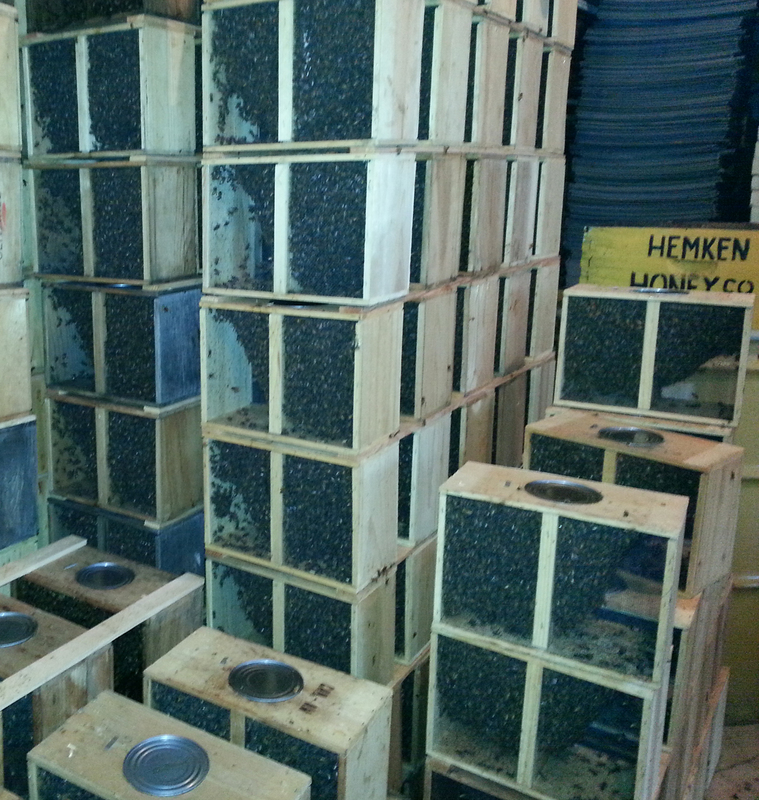 Then, yesterday, we picked up our bees. Andy had said anyone who wanted to could put some of the package bees into one of his hives (“I have 500 packages to install. Every one someone else does is one I have to put in.”). It was one of those rare “something in it for everybody” situations – Andy wins because he has a few less packages to install, and we baby beekeepers really win because we get to practice installing bees into a hive under the guidance and tutelage of an expert. Take top off hive, put it on the side of the hive. 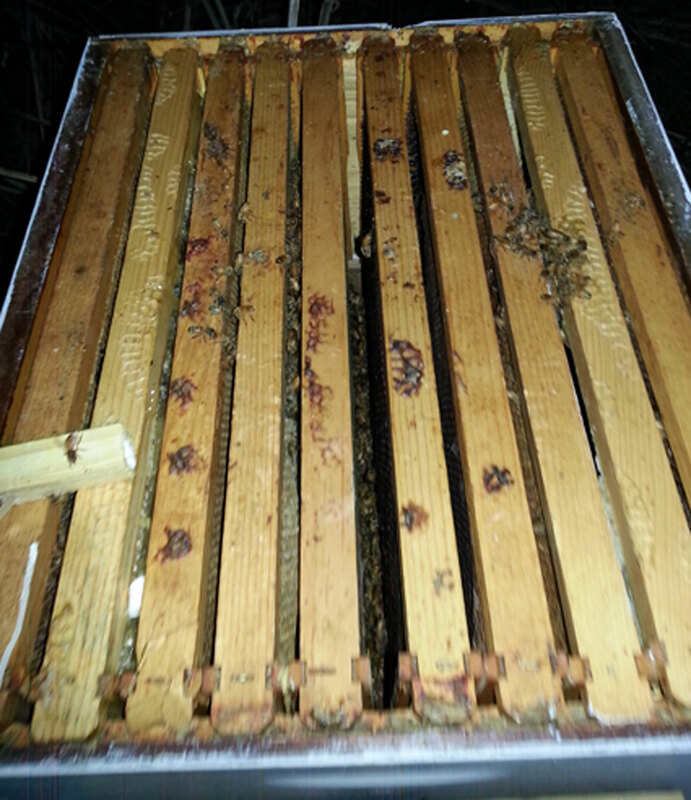 Take out three middle frames, put them in front of the hive. Using hive tool, pry can up from inside bee package. Quickly cover hole from can with square of wood so bees do not fly out. Take hold of small metal piece protruding from top of bee package. Lift piece and slide it toward the covered hole. Uncover hole with hand not holding metal piece, shake it as you remove the tiny wooden block to which it is attached, because it will be crawling with bees who need to stay in the can. Turn wooden block over and peer in at the queen. Make sure she’s alive. She’ll be pacing back and forth in her mesh-covered cage. Pick up a mini marshmallow and a small knife. When the queen is pacing away from the tiny wooden stopper at one end, use the knife to remove the stopper. Quickly plug the hole with your finger. Put down the knife and plug the hole with the marshmallow. Now, if you don’t have stray bees clinging to the queen cage, you can put her in your pocket to keep her warm. I had stray bees every time. So I just put her nearby where she was safe. Pick up the can, quickly remove the wooden top and turn it upside down. Tip the box from side to side, tapping on the side that’s angled down so that the bees fall into the hive. When most of them are out, set it down. Gently replace the frames, making sure you’re not crushing your new colleagues. Now, using a hive tool (if you have one, which we did not), make a space between two of the newly-replaced frames. Place the queen cage there, mesh side down. Hook the metal perpendicular to the cage, so it doesn’t fall in. Close up the hive, and make sure the opening in the box with the remaining bees is facing the hive so the stragglers can find their way to their new home. We came in from the bee yard. I picked out a package from the hundreds there – the sound of all that buzzing was something to hear. Sweetheart wrapped the package up in my jacket and put it in the top case of the motorcycle. We got home as the sun was setting. Sweetheart gets the bees ready for the final leg of their journey from California. The near-final moments of our installation. The queen cage, with our queen (Latifah) inside, is the small bar on the left. It turned out when we got inside, though, that Sweetheart had picked up a hitchhiker. He was standing in front of the open refrigerator when it happened. He slammed the door shut and shook like a dog that had just been sprung from a bathtub. We couldn’t find the bee. Then, a few minutes later, Sweetheart opened the fridge again. She was sitting there, shivering. He picked her up and took her outside so she could find her way to her 8,000 sisters, a few brothers and Latifah, her queen. Congratulations on joining the sorority (which engages in a bit of fraternizing when absolutely necessary).